Pastel is a name of snack or appetizer in Indonesia. It’s kind of pastry then fill with different kind of filling. I don’t know exactly where this food originally came from, since I also see similar food in other countries. But it’s popular across the country and the only thing that make different is the filling. There are 2 different kinds of Pastel in Indonesia. One has normal size which usually fills with carrot, potatoes, chicken/beef meat, boiled egg, and bean thread noodles (soun). 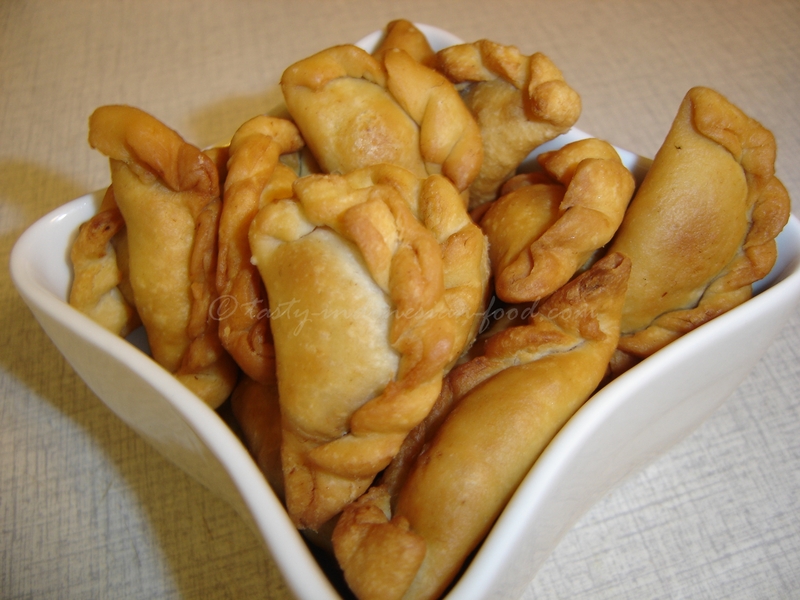 While the other is Pastel mini which is smaller, filled with Abon (dried beef) and usually for light snack. 1. Make the pastry: mix butter with egg, flour, sugar salt with hand. Then slowly pour the water while continue kneading until the texture is no longer sticky and you can roll it. When the dough is still too soft, you may add flour. 2. Roll the dough into 1/4 cm thin and cut into a cylinder with 5 cm diameter. Take a pinch of Abon and place in the centre. Fold pastry over to make half cylinder and crimp at edges. 3. Before frying, store them in the fridge for 30 minutes to make them firm. 4. Deep fry the pastry with lot of oil until golden brown.